Through some of my recent posts you might have found out that I have been listening to shortwave radio since I was a kid. The first ham radio operator that I knew was my uncle Win (Irwin), W1PVC from Norwalk, CT. Uncle Win was an engineer, and had a nice shack in the basement of his house. 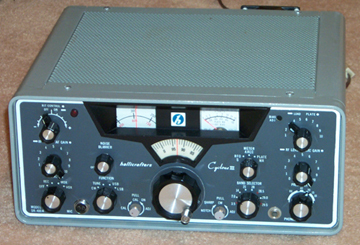 I think he had most of his old equipment displayed around on various shelves, but used a Hallicrafters transceiver. I've looked through photos of Hallicrafters equipment, and I'm pretty sure it was a Cyclone III. He knew of my interest in shortwave and always tried to encourage me to study for my ham license. At some point, my father also decided that it was a good idea for me to get licensed. This is an article I wrote for the Long Island Mobile Amateur Radio Club for their February newsletter (e-log). Last month I wrote about something not directly radio-related, but of interest to a lot of our members, especially after polling people as to what version of Windows they were still using. This month I would like to spout off a bit about something a little more radio-related. A great deal for this radio, which most people describe as having the best audio in its class. I recently wrote a piece for the Long Island Mobile Amateur Radio Club on streaming radio and where it fits into our hobby. Although many die-hard SWLers consider streaming radio to be one of the technologies bringing a slow and painful death to the hobby, I have found that those of us who listen to the programs themselves seem to appreciate it. 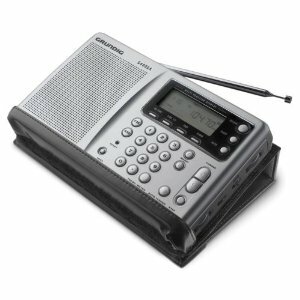 I had a fellow Ham ask about Shortwave listening the other day, and I told him I would put together a collection of links and radio reviews. A lot of this is my own opinion, but much of it from reading the sites listed below. Enjoy! I've been listening since I was a little kid. 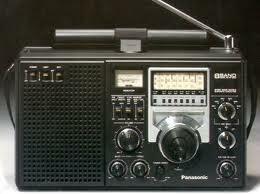 My first radios were National Panasonic analog models, given to me by a family friend. I have owned many of the legendary portables from the 70's and 80's including the Panasonic RF-2200, Sony ICF-6500W, Sony ICF-2010, and Sony ICF-SW7600GR. Windows Windows Windows! Which version of Windows should I be running? With an apology to our Macintosh folks, I want to talk about Windows today, since it is what most of our members are using. At my pre-meeting last month, I asked how many people were still running Windows XP. A majority of the room raised their hands. I wanted to address the positives and negatives of the last three versions of Microsoft’s desktop operating system and make some recommendations for those of you who might be unsure of where to go from here. An additional note: If you are running anything older than Windows XP, You may be doing so due to the age of the hardware it is running on. Anything older than XP at this point is not being updated or supported, and has numerous security holes. Windows XP arrived on the scene in 2002. It is very similar to Windows 2000 underneath. The interface was almost the same as Windows 2000, 98, 95, NT4, and ME, so most of us made the transition well. Service pack 2 added more stability and some very important security features. Service pack 3 added more of the same, and much improved support for wireless networking. Today, the statistics are alarming (or, flattering depending on how you look at it). 32 percent of Windows users are still using XP, an operating system that is going on 10 years old! At the enterprise level that number is actually higher. XP was a great product for Microsoft, and the support has been great. Today though, if you are still running it, there are issues that you need to be aware of. First of all, Microsoft is still supporting XP, but at a minimum level. There will be no more service packs. Major security holes are being patched (if you run updates), but not for much longer. Mainstream support for XP (hotfixes for problems other than major security holes) ended in 2009, and extended support will end in 2014. One of the issues with security is also browser-related. The newest version of Internet Explorer (9) will not run on XP. I know many of you at this point are saying, “but Neil, I run Firefox (or Chrome or Safari, or even Opera)”. Yes, and so do I, but as we all know, every now and then we encounter an IE-only page, and have to run IE, and besides: The newer versions of IE are actually not that bad now (8 and higher). Really. Speaking of software, most likely the next versions of MS Office are also for only Vista and above. There will be many other applications that will not support XP in the near future. One of the reasons is that software manufacturers will be starting to write software for the 64-bit versions of Windows only (since that is what most manufacturers are currently installing), and no one in the software industry wants to support the 64-bit version of XP (a major failure, in both sales and implementation). More on 64-bit Windows later. Windows Vista arrived in 2007, after Microsoft had hyped the development version for 2 years (referred to as Longhorn internally). Vista was not even close to what Microsoft had primed us for, and had several major shortcomings. For one, Vista seemed slow. The speed issues were due to several problems. There were problems with Vista’s networking components that made file-transfers extremely slow. There were driver issues across the board, and the hardware requirements were so high that most systems dragged and complained under Vista. There were also bugs, and issues common with the first release of any operating system, but they seemed worse with all of the speed issues. On top of all of these problems, Vista introduced a whole new Windows interface. While this interface would not have seemed so bad if Vista had functioned better, for most of us it was just insult on top of injury. After dealing with the issues in Vista the new interface seemed like change for the sake of change. Another major issue with Vista was the upgrade process. XP and Vista are different enough that the upgrade is not a technically smooth process, and frequently left users with non-working or poorly working systems. On top of that, Microsoft released so many different versions of Vista, that it was confusing as to which one you wanted to upgrade to. Microsoft at least realized the issues were hurting them, and set about correcting Vista. Instead of changing Vista though, they released a whole new version of Windows. Windows 7 arrived in 2009 and fixes most of the issues with Vista. Better drivers, better networking, better security, and less versions to confuse us. The upgrade problems have been both simplified and complicated now. Simplified, because there is only one upgrade path to come from: Vista! Complicated, because if you are coming from XP, there is no longer and upgrade for you. You will need to back up your files and re-install from scratch. Don’t be afraid though. There are backup wizards on the install DVD to guide you through the process. Just back up your files, and make sure you have the installation discs for any software you need to re-install. If this idea overwhelms you, you can hire someone to do it for you. You’ll pay for the software, and the time involved to install. There is a common myth out there that Vista, with all of the service packs and updates is just as good as 7. This is not so. There is a huge difference with the overhead required to run the two. 7 has less than half the overhead at boot-time than Vista, and that’s with nothing added on! Another myth is that you need even faster and newer hardware to run 7. 7 will pretty much run on anything that can run XP, as well XP was running, as long as it has at least 2 Gigs of memory (4 is ideal here), and was made after about 2006. If your system is running Vista, 7 will run better! If your computer can handle more than 4 Gigs of ram (look it up), then use the 64-bit version of Windows 7. 32-bit Windows can only see up to 4 Gigs. Many of us are afraid of the 64-bit versions of Windows and compatibility issues (after the XP-64 fiasco), but there are very few issues now, and no reason not to use the 64-bit version if you can take advantage of it. If you do any video processing or work with very large images in Adobe-like applications, you will notice a difference in performance with 64-bit Windows and more than 4 Gigs of RAM. So, to sum up, if you have XP, and it’s working, for you, it will continue to work, but you should consider moving up to Windows 7 soon or you may start to have compatibility issues with your aging software. If you have Vista, there is no reason not to upgrade to 7 other than cost. You won’t be sorry with the performance. As always, if you need assistance, drop me an email, or leave a comment over at one of my blogs. 73, and happy computing!